Andrew started in UBC Film Studies courses, but his interest in other subjects led him to choose an interdisciplinary major in cognitive systems. During his last term at UBC, Andrew took a visual analytics lab which changed his career focus. After graduation, he worked at UBC and SFU learning the techniques within this multidisciplinary field. In 2008, Andrew decided to pursue a master’s degree in visual analytics at SFU. He developed a passion for travel after travelling to Europe with a close friend, jumping at any personal or work-related opportunity to travel the world. During this time, Andrew accepted an internship with Boeing Co., and using his visual analytics expertise and working with their safety engineers, he helped precipitate changes in five Boeing aircraft and their pilot safety manual. 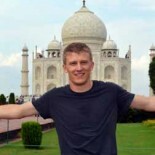 After accepting a career offer with Boeing, Andrew went to India in early September 2011 to work on a project involving SFU, Boeing Co. and Optimus Info Systems. On September 25, 2011, Andrew died along with 18 others when his tourist flight around Mount Everest crashed near Kathmandu. Two days earlier, he had submitted the final revisions for his master’s thesis. His master’s degree was awarded posthumously at SFU in October 2011. Scholarships in his name at UBC and SFU have been established to recognize students who demonstrate interests and acumen in visual analytics. His beautiful smile and passion for life are greatly missed by his family, friends and mentors.